This looks absolutely insane! 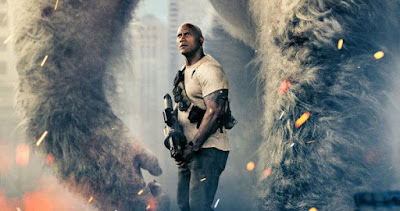 I really like the angle they're taking it with the ape having a personal connection to Dwayne Johnson's character, as it adds an additional level of stakes to the film. It gives it an extra layer of depth that I wasn't expecting from Rampage. They really capitalize on it with this trailer, and I hope they do the same with the final movie. It reminds me a lot of Caesar (Andy Serkis) and Will's (James Franco) dynamic in Rise of the Planet of the Apes, which I think could really work for something like this. And similarly, George has Planet of the Apes-level animation. The CGI overall really does look phenomenal, and I think it's going to make for an incredible experience in the theater. We don't get much of Joe Manganiello or Jeffrey Dean Morgan in this trailer, and I hope that isn't representative of how much we'll see them in the actual movie. They are fantastic actors, and I want them to be heavily present throughout the entire film. As for what didn't work, I didn't exactly care for the song in the trailer. A lot of trailers nowadays shoe-horn in some irrelevant song just because they think they have to, when it really serves no purpose. It's the same here, but I was so taken by the visuals and the story that I was able to forgive it. Overall, I think this looks incredible, and I can't wait to see Rampage this spring! What do you think? Did you like the first trailer for Rampage? Are you looking forward to seeing the film? Leave your thoughts in the comments section below.